Happy New Year Everyone! I hope everybody enjoyed their time during the holidays and coming back with all the more energy to work even harder this year. I know we are full of renewed energy at Klewel. I am bringing you another conference from the medical field, where Klewel is very active. To save all the knowledge that is brought forward at these events is so important. This was actually our second time in Toronto. The first time we have webcasted the 3rd International Course on Oropharyngeal Dysphagia Course from Toronto as well. 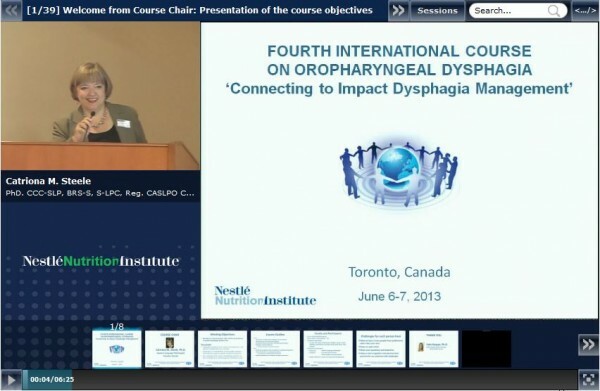 The 4th International Course on Oropharyngeal Dysphagia was held on June 5-7, 2013, at the Toronto Rehabilitation Institute (TRI) in Canada. The educational course provided a unique opportunity to strengthen the knowledge and network of promising clinicians. Participants (65 in total, from 13 countries) learned evidence-based methods of dysphagia patient management. Dysphagia is a growing issue and is a young and fast-developing science. Clinical complications and associated healthcare costs arise when the condition is poorly managed or undiagnosed. Thus, educating multidisciplinary clinicians on the state-of-the-art in dysphagia patient care enables them to build competencies and acquire practical knowledge to help patients live well with dysphagia. New features and topics were included in this 4th annual course as presenters talked about different issues in the light of dysphagia. It was very interesting to learn how dental health can have an effect on dysphagia as you can follow Dr. Baijens’s presentation in the Pathophysiology of oropharyngeal dysphagia section of the presentations. We can also watch an intriguing speech from a former dysphagia patient of the TRI described an inspiring story of her condition, treatment, and recovery. A special dinner followed, thanks to Canadian celebrity, Chef Bonnie Stern. Dysphagia friendly cocktails, appetizers, and desserts were served, and Bonnie presented tips for maintaining the pleasures of eating among those with dysphagia. These activities focused the attending clinicians on the importance of patient-centered care by a dedicated multidisciplinary team. Please click on the picture below to go to the Nestlé Nutrition Institute’s webpage where you access this lecture, along with many others captured by Klewel when you register for free.